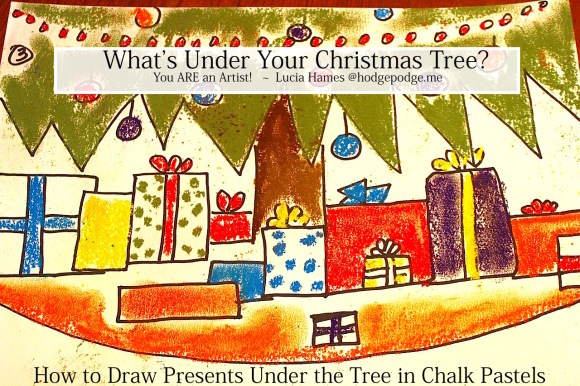 You are here: Home / HomeSchooling / Art for All Ages / You Are An Artist: What’s Under Your Christmas Tree? You Are An Artist: What’s Under Your Christmas Tree? What’s under your Christmas tree? No, I am not the elf on the shelf spying at your gifts under the tree! I thought that this would be fun for all of you artists to paint a picture of YOUR Christmas tree (well, the bottom branches) and all of the secrets packaged in bright colored boxes under the tree. Because You ARE an artist! Let’s choose the colors that we will be using: green, red, black, orange, bright blue, purple and yellow. You might also want to use a pencil to sketch first and even a sharp marker to outline your painting. Turn your paper horizontally. 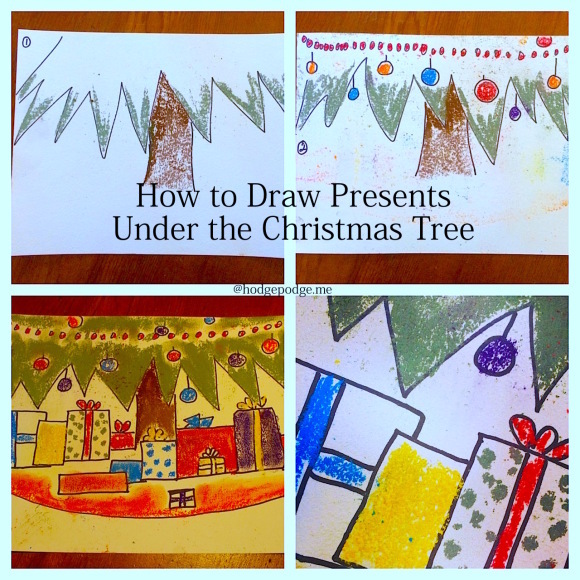 If you feel like drawing your tree and the presents first with a pencil, go ahead. This is your painting! We also decided to outline our sketch in black sharp marker to make the points of the branches and the boxes stand out. So you could consider this art project mixed media, if you like! Pick up your black pastel and begin about three to five inches down from the top of the page. Draw a line of wide “W” shapes. These are the bottom branches of the tree. Take your brown and make a sturdy trunk: just two straight lines in the middle of your Ws, about three inches long for the trunk. Let’s decorate the tree a little bit. I decorated my tree with red garland (maybe cranberries?) and several different colored Christmas ornaments in blue, orange, purple and red. You may have different colored ornaments on your tree. Use the colors that you would like to! Now is the time to smooth in your green tree color with your finger. Be careful not to get green on your ornaments! Paint your presents and ribbons with Christmas colors. Then just a little bit of the tree skirt showing. What a wonderful job you have done! Your packages under the tree are so beautiful – and mysterious! Your tree is wonderful. Be sure to sign your name in the corner, flip the painting over and name it and date it. Put it up where everyone can pick out their present! And remember – You ARE an artist!! 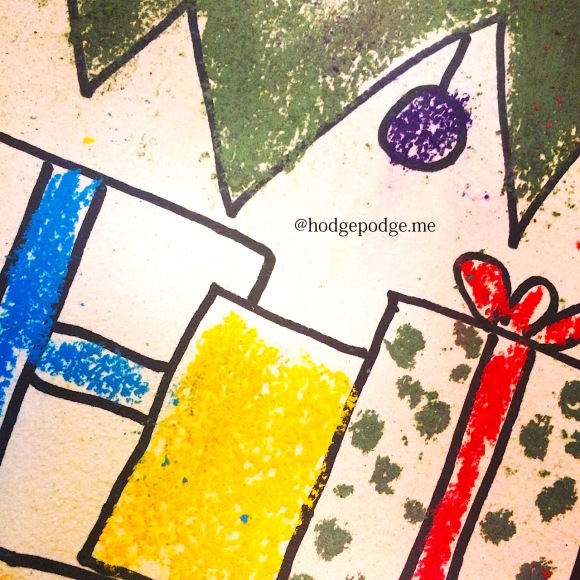 Merry, Merry Christmas from all of us at Hodgepodge! So, paint your packages under your Christmas tree and be sure to share with us! Simply tag @chalkpastelart on social media, use the #YouAREanArtist hashtag, or upload a photo to the ChalkPastel.com Facebook page!